There are two activities on this worksheet. The first activity is to complete the names of the months with the letters that are missing. The twelve months in Spanish in random order and there are spaces (lines) so that students know how many letters there are in the name of that month. The second activity on the right is to write the Spanish months of the year in their correct chronological order. 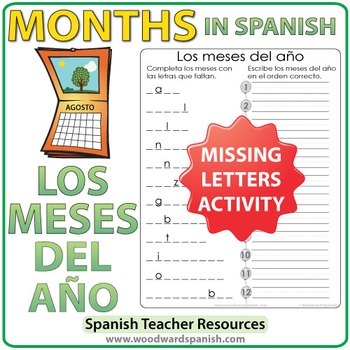 The following words are in this activity: enero, febrero, marzo, abril, mayo, junio, julio, agosto, septiembre, octubre, noviembre, diciembre. This product also appears in our SPANISH MONTHS BUNDLE which contains many more activities for learning the months of the year in Spanish. 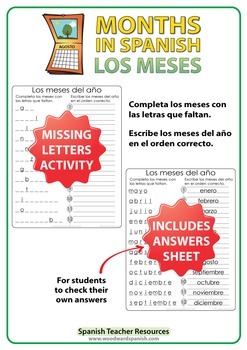 Una actividad con los meses del año en español. Completa los meses con las letras que faltan. Escribe los meses del año en el orden correcto. Please download the preview so you can have a better idea of the quality of this product and what it contains.